At American Airlines employees are under pressure to get flights out exactly on time (“D0”) and almost every can be sacrificed for that goal including taking off without plates for international first class service and not bothering to process upgrades. While there really are flights that take off with empty seats up front with top elites sitting on the upgrade list often when it looks like the wrong person is getting an upgrade (a gate agent choosing to give an upgrade to someone other than the person who is supposed to get it) that perception is really the result of customers misunderstanding what American Airlines is showing on the upgrade list. American shows customers upgrading to three cabin first class from business on the same list as those upgrading from coach to business. 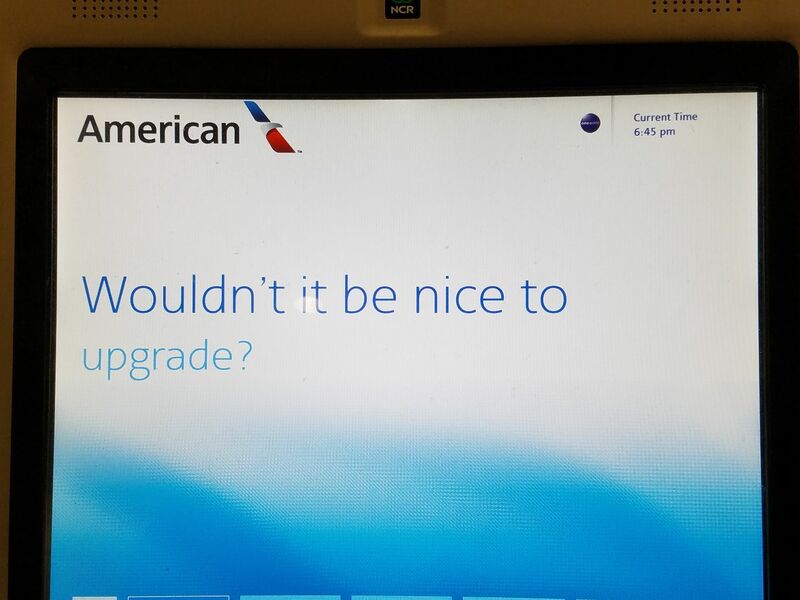 They’ll add someone to the upgrade list after the list has already been processed, making it appear that those customers just added have been ‘skipped over’ even though they may have just changed onto the flight at the last minute. There are several other things American does to make it look like the upgrade list is processed wrong even when it’s processed correctly. I heard the upgrade board will be designed to look like the game chutes and ladders. Gary said: “To be clear this does not sound like any change to upgrades, just to how the upgrade list appears to the customer.” Agreed, accurately reported. However, the American Airlines management are low character folks. I am sure they will try to sneak in a downgrade before they finish. AA management has a 100% trust deficit in my book. This sure smells like a prelude to them screwing over elites by devaluing SWU’s to go from Economy to Premium Economy instead of to Business. And I thought United’s IT was from the Stone Age. UA has had this solved for years, even though it uses the pmCO IT system. So solved and clear that back in 2014 (under the Smisek regime) I knew I was being screwed/gaziumped by last minute TOD upgrade sales. Fortunately that gazumping (at least of 1Ks) went away a year later. These days it’s different at UA. United has a D0 strategy and is making it work. Last minute upgrades are handled by the flight attendants who have the UG list and means to clear it using their smart PDAs. I’ve seen that three times this year. United leads AA (and DL) in D0 and deals with the upgrades smartly. Interesting. I think the airport upgrade list could be clearer (including, like United and Delta do, the number of open seats left, so you know if you have a chance). But I also know that agents do clear the upgrade list incorrectly. This happened to me: I had been rebooked onto flights due to cancellations earlier, and I was #1 on the list more than 30 min. before departure. I watched as the GA cleared random people. I wrote AA and got a very honest note back (with miles) saying that the agent had just done it wrong. Seems she had some friends on the flight or something. @USBT – TODs still exist – I can’t tell you how many times I check in at T-24 as #1 on the UG list, a few seats left, no upgrade space / no PN space (so no GS upgrades)…and magically those seats just disappear over the course of the day, w/o anyone ever showing on the UG cleared list. I once got to the gate and I simply was not on the list. I was on the list until I checked in and then somehow off the list. The gate agent said there is no point as there were 30 people on the list. I said on principal I will like to be added to the list. Guess what I was #1 and got the upgrade. The AA system works some days and not others it’s terribly haphazard. Top tier customers deserve better. LarryInNYC on Are the Poor Subsidizing Your Credit Card Rewards?